The purpose of the academic program at the University of Cincinnati College of Law is to provide its graduates with the opportunity to equip themselves for effective and creative participation in the roles lawyers play in our society. These roles include counselor, litigator, negotiator, drafter, advocate, and decision-maker in virtually all aspects of our society, public and private, civil and criminal. Lawyers' involvement in government at the local, state and federal levels in the executive, legislative, judicial, and administrative departments of government has been recognized repeatedly. Lawyers are also intimately involved in the multitude of affairs, including business and family, that constitutes our national life. The College of Law recognizes that, in developing an academic program to enable its graduates to perform effectively as lawyers, it must provide them with a combination of substantive knowledge, ethical sensitivity, and analytical and practical skills that will enable them not only to function competently in the period immediately following admission to the bar, but also to grow and to adapt as the law and society develop, and the roles they play and the context in which they play them change over substantial periods of time. The College recognizes that to train lawyers to practice law only at one time, in one place, in a single context does not serve well either its graduates or the clients they represent. Students at the University of Cincinnati get the “small class sizes” and “intimate envi­ronment” typical of a private college while paying the comfortable, low tuition you would expect from a public institution. With roughly 125 students in each entering class, the school strikes an “excellent” balance with “its affordability, reputation, small class size, and excellent faculty. Students agree that UC professors are an “amazing and diverse group of people who care just as much for teaching and students as they do about publishing their own work.” UC is particularly noted for its focus on “public inter­est” and “international” law; however, “There is no shortage of brilliant legal minds in a broad range of subjects—that goes for students as well as the professors.” In addition to the accomplished tenured faculty, students rave about the school’s recent acquisition of “exceptional young faculty members that have great teaching skills to match their great scholarship.” A 2L sums it up, “As one of the smallest public law schools in the country, I feel my educational experience has been fantastic, and yet, at very little cost. Because our class consists of only 128 people, all of my professors know my name.”University of Cincinnati runs several “amazing” legal institutes and research centers focused on unique topics such as domestic violence, law and psychiatry, and corporate law. Through these centers, students can earn credit hours while doing fulfilling and useful work in the community. Many students make particular note of the Ohio Innocence Project, an institute at the University of Cincinnati through which students conduct substantive work to impact legislative reform, and work on real criminal cases. The institute also brings notable speakers to campus. Students also have the opportunity to research and write for the school’s renowned publications, including the Human Rights Quarterly, Law Review, and Freedom Center Journal. While students at other schools might scramble for spots on the school’s law review or clinic programs, “Since the school is small, each student can participate in and get involved in a number of organizations.”Thanks to an “ambitious but not overly competitive student body,” the learning envi­ronment is charged, but not cutthroat, at University of Cincinnati. 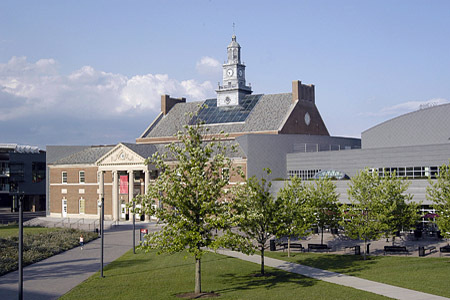 A 3L attests, “While academic achievement is always a numbers game in law school, the atmosphere at UC is nonpretentious and noncontentious.” When it comes to the job and internship place­ments, University of Cincinnati maintains a “deep and well-regarded history as a legal educational institution” both locally and nationally. As a result, most students say the school “is a great place for students with all different kinds of career aspirations, and especially has a public interest/human rights orientation that I think is unparalleled in the Midwest.” In fact, “Public interest students can actually obtain funding for their sum­mer jobs through the school’s Summer Public Interest Fellowship Program.” Most UC grads stay in the Cincinnati area and meet with good results while those looking outside the region must do a little extra legwork to find a good placement. “While plenty of our grads go on to excellent careers in major firms, federal clerkships, and other government positions, I don’t feel like our school does enough PR work to get out-of-town employers interested in our students,” says one student. Want more info about University of Cincinnati College of Law? Get free advice from education experts and Noodle community members.